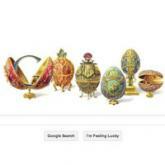 Russian jeweller Peter Carl Fabergé - best known for creating the famous Fabergé eggs - has had the 166th anniversary of his birth celebrated with a Google doodle. The search engine has turned its homepage emblem into a set of six gold eggs decorated in diamonds, precious metals and gemstones in tribute to the designer. Fabergé was born in Saint Petersburg, Russia on May 30, 1846 to the Baltic German jeweller Gustav Fabergé and his Danish wife Charlotte Jungstedt. His father was an established jeweller, dealing in fine decorative objects, which his son continued after inheriting the family business in 1870. Fabergé quickly developed a reputation for producing exquisite jewelled objects including the Easter egg designs which made him world famous. In 1882 at the Pan-Russian Exhibition in Moscow, Fabergé won the gold medal. He was appointed as the court jeweller of the Romanov dynasty in 1885. He died on September 24, 1920 at the age of 74.